Previously, Voigt announced that he will race for another year. 42-year-old German (born 17 September 1971) turned pro in 1997 with ZVVZ-Gian-AIS, and has ridden for Credit Agricole, CSC/Saxo Bank, and Leopard-Trek/RadioShack over the years. He has taken part in the Tour de France 16 times, every year since 1998, and has won two stages, in 2001 and 2006. He joined what then was called Leopard Trek in 2011, and remained on board when the squad became RadioShack-Nissan in 2012. Nissan ended its role with the team at the end of last season, and the team became RadioShack-Nissan. As the end of the 2013 season approaching, the team’s future in doubt for 2014, Trek purchased the squad from Leopard SA, owned by Flavio Becca. The inside of the drive-side chainstay of Voigt’s Madone shows off the six professional teams that he has raced for: Giant-Australia Institute of Sport, Credit Agricole, CSC, Saxo Bank, Leopard-Trek, and Radioshack-Leopard. Next year, a seventh team can be added to that list, with Trek Pro Cycling announcing its one-year signing of the German. Jens Voigt’s favorite quote, “Shut up legs” is printed on the down tube. It’s a shame that the Bontrager plastic bottle cages blocking it. The drive side is a tribute to Voigt’s 1994 Peace Race win. 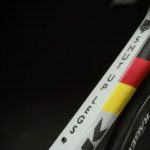 Nearly very inch tube of Voigt’s Madone is symbolic of his career and his life. This stripe down the top tube lists some of his top results, including, “1x Tour of the Mediterranean winner, 1x Tour de Pologne winner, 5x Critérium International winner, 2x Deutschland Tour champion, 2x Giro d’Italia stage wins,” and so on. 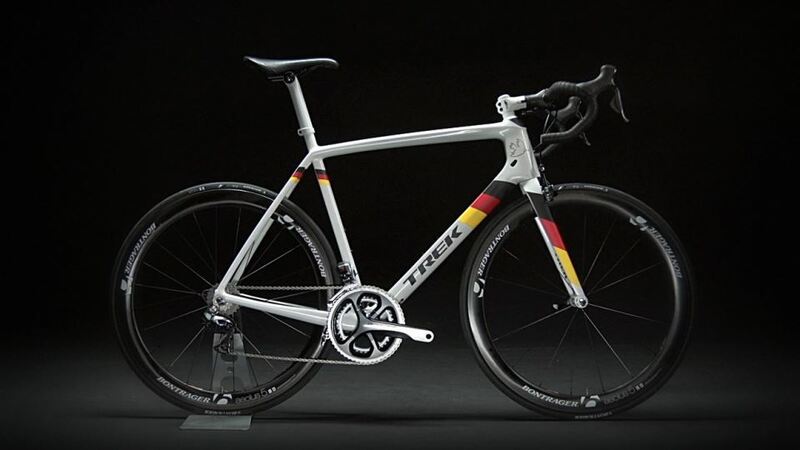 A tribute to Germany’s Peace Race, the “Peace Dove,” by Pablo Picasso, adorns the drive side of the head tube. The East German flag inside the non-drive-side chainstay. Voigt lived in East Germany until he was 18. All six of Jens Voigt’s children and his wife, Stephanie, are listed on his top tube as a reminder of what’s most important in his life.